Thyroid Hormone Preparation Overdose is the accidental or intentional intake of the drug in dosage higher than prescribed values. What is Thyroid Hormone Preparation Overdose? Thyroid Hormone Preparation Overdose may be also referred to as Thyroid Preparation Overdose. What are the Causes of Thyroid Hormone Preparation Overdose? What are the Signs and Symptoms of Thyroid Hormone Preparation Overdose? The signs and symptoms of Thyroid Hormone Preparation Overdose can vary from one individual to another. It may be mild in some and severe in others. Several systems of the body may be affected. 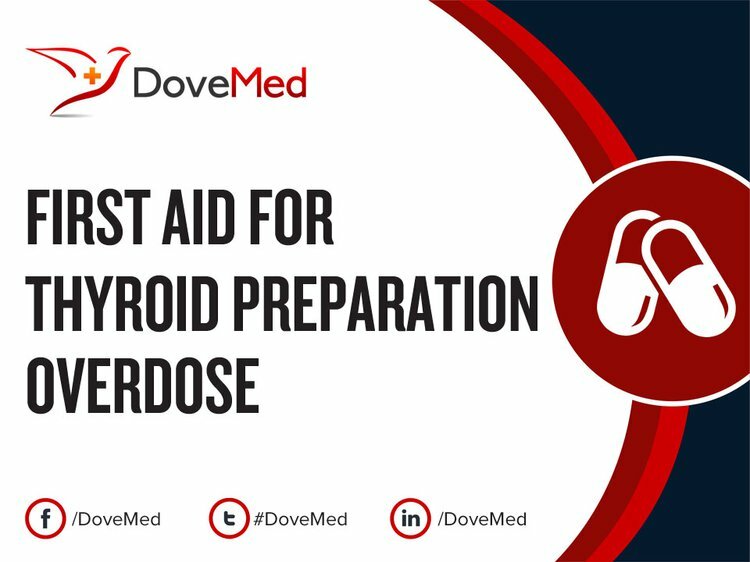 How is First Aid administered for Thyroid Hormone Preparation Overdose? Who should administer First Aid for Thyroid Hormone Preparation Overdose? First aid for Thyroid Hormone Preparation Overdose is administered by healthcare professionals. What is the Prognosis of Thyroid Hormone Preparation Overdose? How can Thyroid Hormone Preparation Overdose be Prevented? Jha, S., Waghdhare, S., Reddi, R., & Bhattacharya, P. (2012). Thyroid storm due to inappropriate administration of a compounded thyroid hormone preparation successfully treated with plasmapheresis. Thyroid, 22(12), 1283-1286. Schäffler, A. (2010). Hormone replacement after thyroid and parathyroid surgery. Dtsch Arztebl Int, 107(47), 827-34. Klubo-Gwiezdzinska, J., & Wartofsky, L. (2012). Thyroid emergencies. Medical Clinics of North America, 96(2), 385-403. Zhang, B., Tang, D., Liu, B., Cui, Y., Chen, H., & Chen, G. (2012). Nanogold-functionalized magnetic beads with redox activity for sensitive electrochemical immunoassay of thyroid-stimulating hormone. Analytica chimica acta, 711, 17-23. Saenz de Miera, C., Hanon, E. A., Dardente, H., Birnie, M., Simonneaux, V., Lincoln, G. A., & Hazlerigg, D. G. (2013). Circannual Variation in Thyroid Hormone Deiodinases in a Short‐Day Breeder. Journal of neuroendocrinology, 25(4), 412-421. Ojomo, K. A., Schneider, D. F., Reiher, A. E., Lai, N., Schaefer, S., Chen, H., & Sippel, R. S. (2013). Using body mass index to predict optimal thyroid dosing after thyroidectomy. Journal of the American College of Surgeons, 216(3), 454-460. Vyas, A., Vyas, P., Fillipon, N., Vijayakrishnan, R., & Trivedi, N. (2010). Successful treatment of thyroid storm with plasmapheresis in a patient with methimazole-induced agranulocytosis. Endocrine Practice, 16(4), 673-676. Bhavnani, B. R., & Stanczyk, F. Z. (2012). Misconception and concerns about bioidentical hormones used for custom-compounded hormone therapy. The Journal of Clinical Endocrinology & Metabolism, 97(3), 756-759.